Winners will be announced here once the campaign period ends. Please take care not to lose your serial card. The announcement will occur within 1 month after the campaign period ends. The participating stores in each area will also reach out to winners separately after the official announcement. Each serial number can be used to enter as many times as you like. 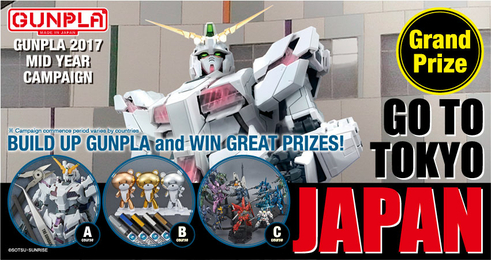 ■One will win a trip to Japan to visit the Gundam Base in Odaiba! 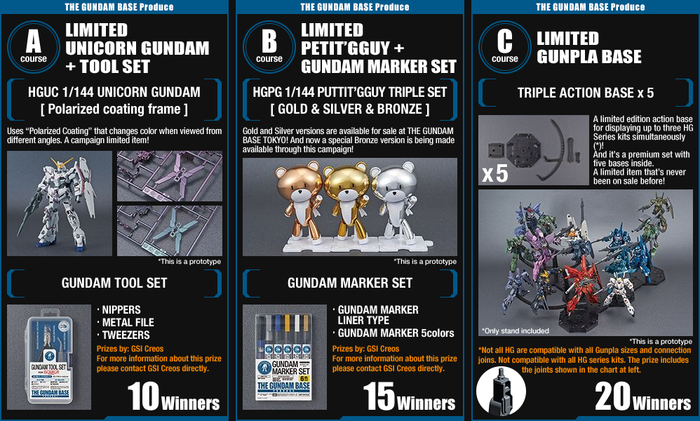 *Winners will be contacted after the official announcement, via the regional Bandai office or participating store. ・Prizes will be sent 1-2 months after announcement of winners. ・Prizes will be sent to the address registered to the winner’s Bandai Namco ID. *We cannot accept address changes after the campaign has ended. ・Winners cannot specify a delivery date. ・The prizes will be sent by Bandai or its representative and the method may differ by region. ・Please take time to confirm that your information registered to your Bandai Namco ID is correct. In the event a prize cannot be delivered to the registered address, the prize will be forfeit. ■ Entry is limited to those with Bandai Namco IDs and the campaign details will conform to the regions or countries registered to the ID. ■ Some of the photographs of prizes may be prototypes and are intended for illustrative purposes only. They are subject to change without prior notice. ■ We cannot answer inquiries about this contest. ■ As the prizes are intended for members only, please do not cancel your membership before prizes arrive. ■ Entrants may not give, transfer, or sell their right to entry to third parties. ■ Once you choose a prize course, you cannot change your selection.